Crowds outside the Lincoln Memorial dance to bomba after a 2-mile march from the Capitol. “Used and disposed” isn’t how one Puerto Rican hoped to feel two months in from the island’s most devastating hurricane strike in a century. By November, the unofficial death toll lay in the hundreds, half the island was still in darkness, and rumors of disease and starvation trickled in from the island’s interior. A record-breaking hurricane had made a direct hit on a U.S. territory, and weeks later, medicine, food, and clean water were still in short supply. For hundreds of Puerto Ricans, the time had come to march on Washington and reignite a long-standing debate over the island’s relationship with the U.S.
For Mejil and other Puerto Ricans rallying outside the Capitol on Sunday, Washington’s botched response to Maria is the culmination of centuries of indecisive, partisan bickering over Puerto Rico’s place in America. Beltway politicians might still argue about the island’s status, but for many at the march, the verdict was in. Instead of a government rushing to the aid of its people, Maria’s aftermath had exposed a colonial power neglecting its colonized. 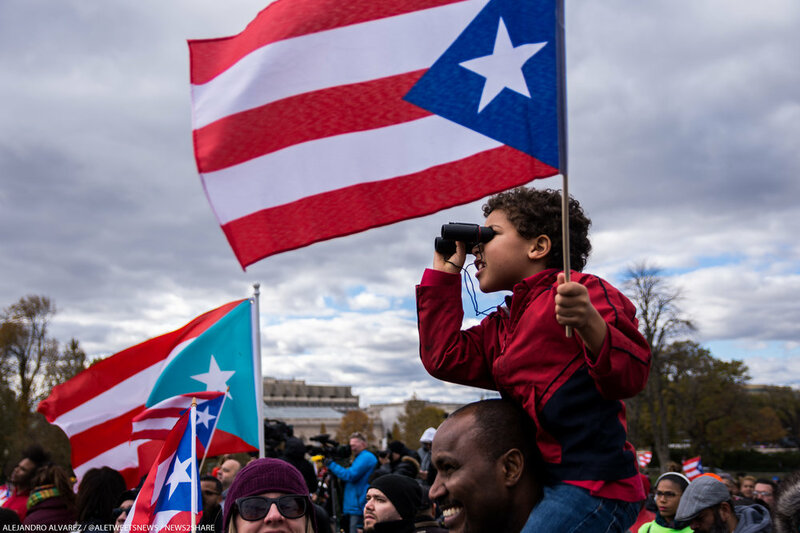 Puerto Ricans attended the event from as far away as Maine and Wisconsin, turning the Capitol’s west lawn into a sea of Puerto Rican flags. Bundled with a two-mile march to the Lincoln Memorial, the event demanded Congress change regulations and policies they blame for strangling the island’s recovery. To start, that meant altering the Merchant Marine Act of 1920, commonly known as the “Jones Act,” which limits seafaring cargo between American ports to U.S.-flagged ships. Critics say this creates a bottleneck for aid organizations moving supplies to the disaster-stricken island. The Trump administration came under fire for waiting a week before granting a 10-day waiver to the law in late September, which it then allowed to expired without renewal. While U.S. shipping interests claimed they had enough resources to support the aid effort on their own, event goers painted a different picture of a country still lacking supplies, with a crippled infrastructure and ailing economy. A father and son view speeches at the Capitol from afar. 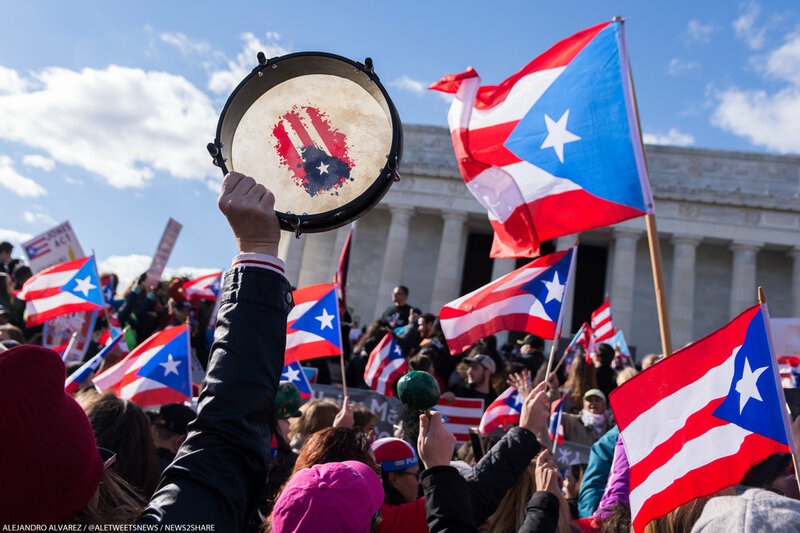 Though organizers stressed they intended to avoid a “political agenda,” the Unity March for Puerto Rico took on a decisively anti-colonial, pro-independence tone - especially through speakers like Rep. Luis Vicente Gutierrez who, while representing Illinois’s fourth district, has supported a growing movement seeking full sovereignty for the island. Gutierrez joined other speakers in calling for a Congress to forgive Puerto Rico’s debt, which he attributed to a “colonial relationship” with Washington preempting the Puerto Rican people from being able to “live freely.” Inefficiency and mismanagement have rocketed the government’s outstanding debt to a crushing $73 billion, and the island had been seeking quasi-bankruptcy protections afforded by an Obama-era debt restructuring law. Puerto Rico’s debt only adds another serious obstacle for a devastated island that must also invest in a near-total reconstruction of its electrical grid. Speaking to Fox News during his post-storm visit to San Juan, President Trump turned heads when he implied that Puerto Rico’s debt would first need to be “wiped out” despite the extensive damage it had endured. That economic crisis, coupled with the gargantuan recovery effort that lies ahead, has some asking whether Puerto Rico, which has been a territory of the United States since 1898, would be better off as an independent nation. “Personally, I would love to see it be on its own,” said one attendee, a woman from Florida whose parents were left stranded without food and water for weeks in Mayaguez, a city along the island’s west coast. “I don't see us being part of the United States as very helpful right now,” she said,” adding that the federal response to the hurricane had made her more likely to support the island’s independence movement. “I think the US has shown its true colors, and at this point, we wouldn't do any worse on our own." Moving out from morning speeches, a long procession of Puerto Rican flags set off down Independence Avenue bound for the Lincoln Memorial, chanting “Puerto Rico se levanta,” Spanish for “Puerto Rico rises," and "presente" - simply put, "we're here." Award-winning playwright Lin-Manuel Miranda, creator of “Hamilton,” marched with his father and mother, holding a banner reading “Fight for Puerto Rico.” Together with the Hispanic Federation, Miranda said he had raised over $20 million dollars for the relief effort. He later announced his collaborative benefit single, “Almost Like Praying,” had raised $500,000. An estimated 150,000 Puerto Ricans have moved to Florida since Maria and Irma. In a swing state where Trump beat Hillary Clinton by about 119,000 votes, that mass exodus may have political repercussions for Republicans if public perception of aid efforts remains low. While law bars Puerto Ricans from voting for president on the island, they regain that ability upon moving to the mainland - a matter Miranda was eager to remind Congress about when he spoke to marchers at the Lincoln Memorial.